July 7 marks the 120th anniversary of the birth of Russian poet Vladimir Mayakovsky, the brooding James Dean of Futurism, and while his despair eclipsed his enormous talent, he lives on in verse. Vladimir Mayakovsky had just turned 13 when he read Marx for the first time. Soon he participated in secret meetings and handed out Bolshevik Party pamphlets. In 1909, he was arrested for the third time as a teenager and spent eleven months in Butyrka Prison. In the solitude of cell 103, Mayakovsky honed his writing and his art. “I remember when my brother came out of prison we were all so excited. The first thing he did was go and wash his hands,” his sister had recalled. Those who knew him intimately recalled his obsession with cleanliness, and the fact that he carried his own soap. Mayakovsky was born on July 7th, 1893, in Baghdati, a small town in Georgia where his father worked as a forest ranger. In the company of his father, among the mountains and the murmur of the river, he discovered the rhythm and music of the verses he would eventually write. But he was an especially sensitive and at times troubled child who was slow to read, according to his biographers. The tragic and sudden death of his father from sepsis – from a small prick with a rusty pin – caused Mayakovsky’s family great anguish. It also probably brought on his ritual cleanliness. The family moved to Moscow and lived hand to mouth. After prison, he quit the communist party and enrolled in the Moscow Art School, where he met David Burliuk, his best friend, “his first master,” the first who believed in his poetry and who offered him 50 kopecks a day so he could write and not go hungry. With his friend Burliuk, he embarked on an adventure called the Futurist Movement, which rejected any artwork that smacked of the bourgeoisie. In 1912, they published “The Slap in the Face of Public Taste,” with texts by David Burliuk. Alexander Kruchenykh, Vladimir Mayakovsky and Velimir Khlebnikov. Vasily Kamensky soon joined the group. The Futurists would cause scenes in public and were not taken seriously by the Russian intelligentsia. Their poetry evenings were provocative. Sporting yellow shirts, top hats and canes, their faces painted, they read their poems to audiences that howled and booed them. Akhmatova recalled the young Mayakovsky, who along with his noisy companions frequented the Stray Dog, a cellar bar where the St. Petersburg intellectuals of the day gathered. 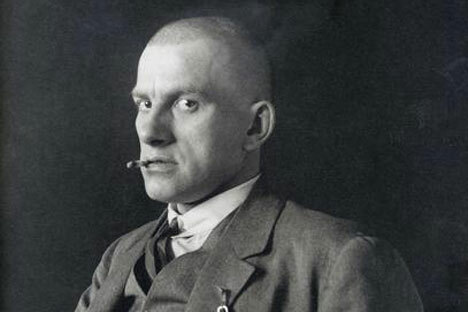 Regardless of his irreverent ways, Mayakovsky’s poems were praised by Blok, Gorky, Pasternak and Akhmatova. In the summer of 1915, Mayakovsky had a decisive encounter with Lilya and Osip Briks. He dedicated his most beautiful poetry to Lilya throughout his life (“A Cloud in Trousers,” “The Backbone Flute,” “The Man,” “About That”). Lilya was his muse, and although there were other women, she was his great love. Osip, in addition to being his friend and editor, was a faithful ally in every cultural undertaking. Author Viktor Shklovsky wrote: “Mayakovsky entered the revolution as he would enter his own house.” The poet finally saw his dream from adolescence come true. From that moment on, there would be no rest for him. It was the Futurists, following Mayakovsky’s slogan – “the streets our paintbrushes, the squares our palettes” – who collaborated with the new government. Mayakovsky became a one-man band. He could be found arguing in meetings about how to organize the arts in the Soviet Union, writing poetry for propaganda posters or visiting factories. The “poet of the revolution” contributed to newspapers and magazines, wrote screenplays and worked as an actor in films like “Not For Money Born,” “The Lady and The Hooligan” (which can be viewed online) and “Fettered by Film,” which co-starred Lilya Brik. By then, the “Seventh Art” enjoyed great popularity in Russia. Mayakovsky liked Buster Keaton and Chaplin. American cinema fascinated him because it had created a unique language. In the mood to do “whatever necessary,” he teamed up with the extraordinary photographer and artist Alexander Rodchenko and they pioneered a new kind of graphic art and a maverick form of branding the communist message. Their emblematic work is frequently mimicked today. Rodchenko’s powerful, brooding photos of Mayakovsky are among the most iconic photographs of the era, and a striking visual testament to Mayakovsky’s magnetism. In 1923, Mayakovsky and Osip Brik founded LEF, the magazine of the movement “Left Front of the Arts.” Mayakovsky still had time to devote to his poetry. He became a catalyst of the artistic avant-garde, and a multidisciplinary artist before the concept was even invented. Paradoxically, Vladimir Mayakovsky seemed to choose the same path five years later. The official story was that he had committed suicide because of an unhappy love affair. It was also rumored that the secret service had killed him because of the increasingly individualistic nature of his writing, and that his friends Osip and Lilya Brik had been spying on him for the authorities. It cannot be overlooked that, as of 1930, Stalin’s purges targeted intellectuals. Furthermore, it is also true that the poet was going through difficult times. He was demoralized and deeply disillusioned by the course of Soviet politics, and by the criticism levied against him by the implacable Russian Association of Proletarian Writers (RAPP). His last plays, “The Bedbug” and “The Bathhouse,” had been total failures. On April 9th,1930, during a meeting with university students, he had been booed and rudely attacked. As admired as he was hated, his excessive passion for poetry understood as a revolutionary act does not hide the fact that Mayakovsky was a man of tremendous fragility. Today is a great day to discover the music of his poetry.